TNP 6.35mm Guitar Cable (25FT) 1/4 Inch TS Male 6.35mm Phono Jack Straight Plug Musical Instrument Patch Cable Wire Cord For Electric Bass Guitar, Amplifier Speaker Electric Mandolin, Line-level Audio by TNP Products at Debbie Dee Music. MPN: CBL_63M_SS_25FT_BLK. Hurry! Limited time offer. Offer valid only while supplies last. A 6.35 mm (1/4 inch) two-contact phone connector used for various signals including electric guitar, loudspeaker, microphone and line-level audio. A 6.35 mm (1/4 inch) two-contact phone connector used for various signals including electric guitar, loudspeaker, microphone and line-level audio. Almost all electric guitars, guitar amp, instrument amplifiers for guitars, basses and similar amplified musical instruments use a 1/4 in mono jack (socket) as their output connector. Some professional audio equipment uses TS jacks as the standard unbalanced input or output line-level connector. 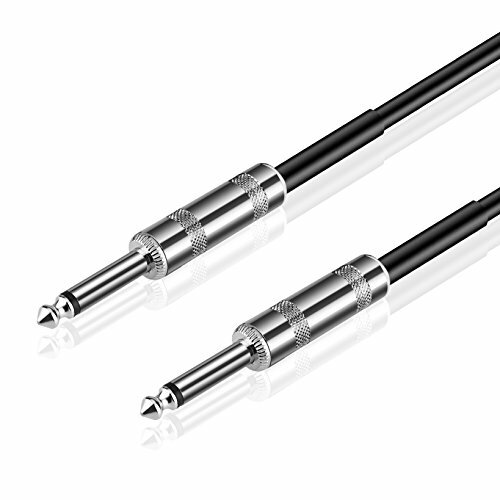 This Gold Plated 6.35mm Mono Jack 1/4" TS Cable is designed to connect instruments such as synths, keyboards, guitars and other professional audio equipment. Made of oxygen free copper (OFC) conductors for excellent signal clarity, perfect for studio or live concert performances.